Listen to Joyce Hinnefeld read an excerpt from In Hovering Flight while offering insightful commentary. This reading was done at Politics and Prose Bookstore on November 16th, 2008. Alongside eloquent riffs on birds and the natural world, Hinnefeld has composed a pair of contained but rich coming-of-age stories..
At 34, Scarlet Kavanagh has the kind of homecoming no child wishes, a visit back to family and dear friends for the gentle passing of her mother, Addie, a famous bird artist and an even more infamous environmental activist. Though Addie and her husband, ornithologist Tom Kavanagh, have made their life in southeastern Pennsylvania, Addie has chosen to die at the New Jersey home of her dearest friend, Cora. This is because the Kavanagh’s ramshackle cottage is filled with too much history and because, in the last ten years or so, and for reasons that are not entirely clear, even bird song has seemed to make Addie angry, or sad, or both. Now, in their final moments together, Scarlet hopes to put to rest the last tensions that have marked their relationship. Through tender conversations with Cora and Lou, another of Addie’s dear friends, Scarlet slowly comes to peace with her mother’s complicated life. But can she do the same with her own? Scarlet has carried a secret into these foggy days - a secret for Addie, one that involves Cora, too. In its structure and style this novel follows in the tradition of writers like Virginia Woolf, Harriet Doerr, and Carol Shields: musical and dramatic, with myriad stories and voices. 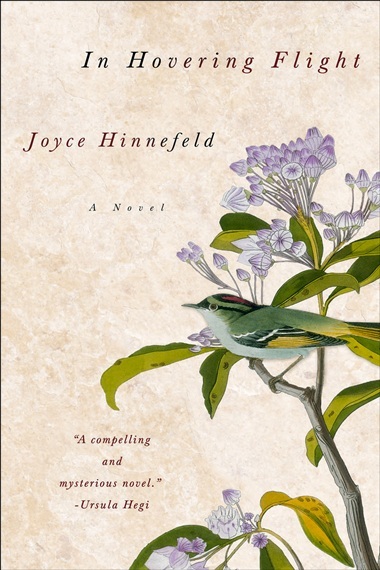 But the evocative language of this soaring novel is Hinnefeld’s own.